So it was birthday time again, my mom this time. And if history tells me so, you know she’s gonna pick a sushi restaurant. She’s a pretty predictable lil lady. So this time, we stayed round me and she picked Mikado / Thai Pepper. The place has been around for a long time, but it’s been years since I’ve been there. And the last time I was there, it was still two separate restaurants. Now they’re physically linked together. So because these two restaurants are together, you can get both japanese and thai cuisine at the same time, which can be handy. So I got an ardmore roll as a little appetizer. 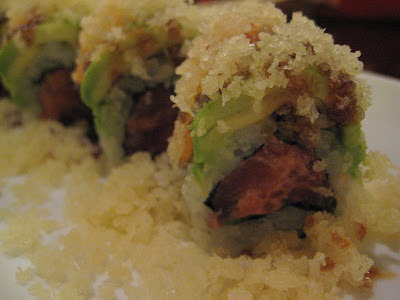 I forget exactly what it was but it had spicy tuna, avocado, and tempura crunchies on it, with some sauce on it. This was delicious! 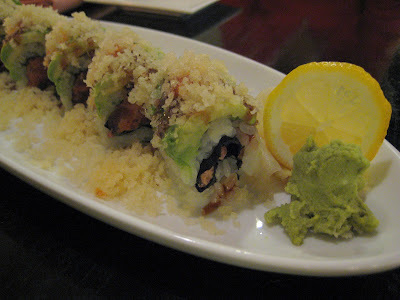 And it had some of the softest most melt-in-your-mouth avocado I’d ever had. And the roll was so big! I picked a damn winner this time around. My mom got the sushi and sashimi for one. This is what she typically goes for, one of those for one dealies. 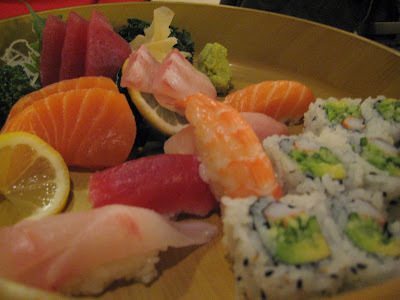 It had plenty of food in it, but the fish was pretty standard – tuna, salmon, shrimp, and one other thing. So nothing extra special in this, but plenty of food for one person. And the sashimi was nice and thick. 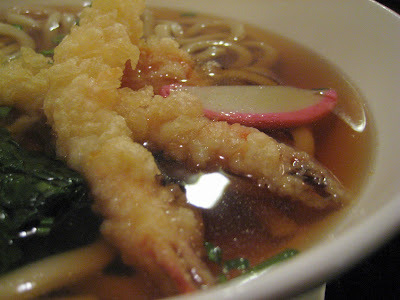 For me, I got the tempura udon. When I feel like getting a non-sushi entree, I usually always go with an udon dish. I love me some udon noodles. And while it’s still not the warmest out, I’m going to enjoy as much soup as I possibly can. This udon was ok. The broth was nothing special, and neither were the noodles. The shrimp were pretty good though, and it also had some carrot and sweet potato tempura in it too. The portion was surprisingly large for the price. All in all, a decent bowl of udon and a pretty decent price. The service was pretty good. Our waitress seemed to be japanese, fresh off the boat, and her grasp of the english language was questionable. She started every sentence with “excusa me”. It was too polite and after awhile, it got annoying. She doesn’t have to excuse herself when she brings me food, it’s her job, and it’s what I went there for! In all, everyone was very pleasant and friendly.